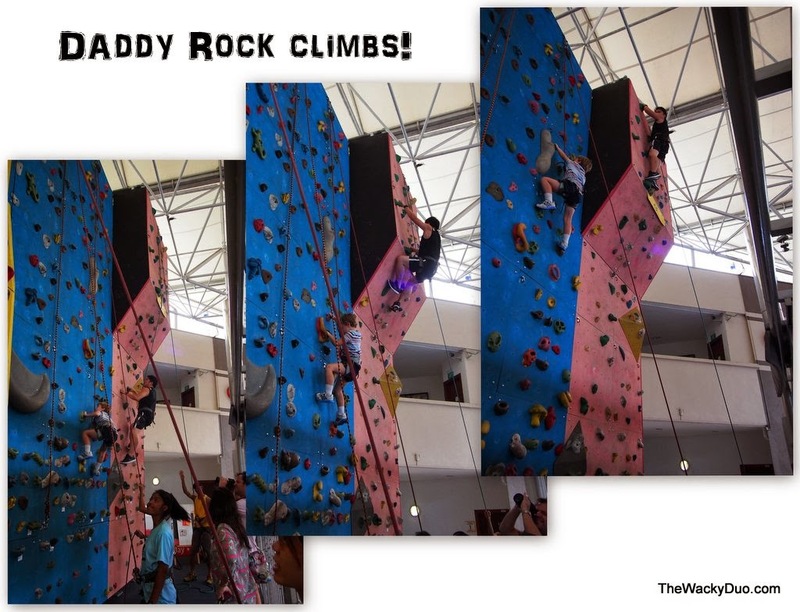 Remember our Rock Climbing experience last year? Since the experience at the rock school, I was itching to get back to climbing. My daily climbs ( on sofa, tables, beds) attest to my eagerness to climb. We were glad when an invitation landed on our lap from The Rock School. This time round, the invite is for me as well as Daddy! Honestly I was still a little apprehensive since my last climb. Nevertheless I was determine to give it a go. As for Daddy, let's just say he is a bigger monkey than me. His enthusiasm to conquer the wall is all too apparent from his gleeful look when he broke the news to me. We opted for the Sunday session. We reached the place early and had some time for a warm up session before the climb. As I entered the premises, I spotted my photo on the wall. Can you find it? I want to climb too! Before we start, we were briefed on the basic of rock climbing. There was another pair of brothers with us on that day. After a quick brief, we were off to have some games before the start of the climb. We love how the Rock School is able to focus their activities according to the kids age. The fun actually started way before the climb. Before long, we are all ready for the climb. Being the older brother , I showed how it was done before Didi gets his turn. We did a few rounds of practise climb . All these a necessary for the big climb at part 2 of the lesson. Didi tries to catch up with the rest of the class. He is quite brave for his age, or perhaps at this age, kids a generally less fearful of challenges. Rock Climbing comes quite naturally to kids. It does feel like crawling , except that you are doing it vertically instead of horizontally. As much as the instructors are watching us ( we have a one to one instructor guiding us), it is inevitable that accidents may occur. I had slipped and had a slight bruise on my chest. Thankfully the instructors are prepared and helped clean off the wounds with antiseptic. We noted that some of the instructors are trained in first aid as well, so you are in good hands. After 3 rounds of climb, it is time to head to the ' Big Wall' will I be able to conquer my fear this time? We were brief on the climbing and descending. The climbing does not seem to be an issue, but it is the descending that I have some reservations on. The climb begins , would my nerves hold? Daddy decided to have a climb on his own. He reached the top of the pink wall in double quick time. He did said it was a blast and it was easy to reach the top. I half believe him as I see a little twitch in his eyes and the curling of his mouth as he spoke. Later in the evening I had learned that the twitch is the result of him climbing up too fast and he had accidentally sprain his wrist... Daddy you must remember you are not 20 anymore!! I had trouble overcoming my fear of descend. The instructor says it is normal. Not every kid would overcome this especially if they are more aware of their circumstances. So I guess I could pinpoint my fear to my matured thinking?Daddy can attested it does look a little scary from the Peak. He decided to do a tandem climb with me to ease my fears. In case you are worried equipments are checked thoroughly before the climb. If it can hold a 'heavy' person like daddy, it can hold me firmly. As for my tandem climb with Daddy,I managed to scale up to the hill, before the nerves got the better of it. Nevertheless the instructors were very encouraging. The instructors are certified with rock climbing proficiency. I must say they handle children very well too, giving them encouragement when needed. At the end of the day, we get stickers for our climb. Didi has some stickers as well for his effort indoors. Even though I did not make it to the peak, it was an afternoon well spend. Next time when Didi turns 4, we could go for a class together. Maybe with a training partner, I could conquer my fear. If you are interested, there are a few options for classes, starting from Pebbles for age 4 and up to Double up classes where the parents could join in the fun. For more on the classes, do refer here. 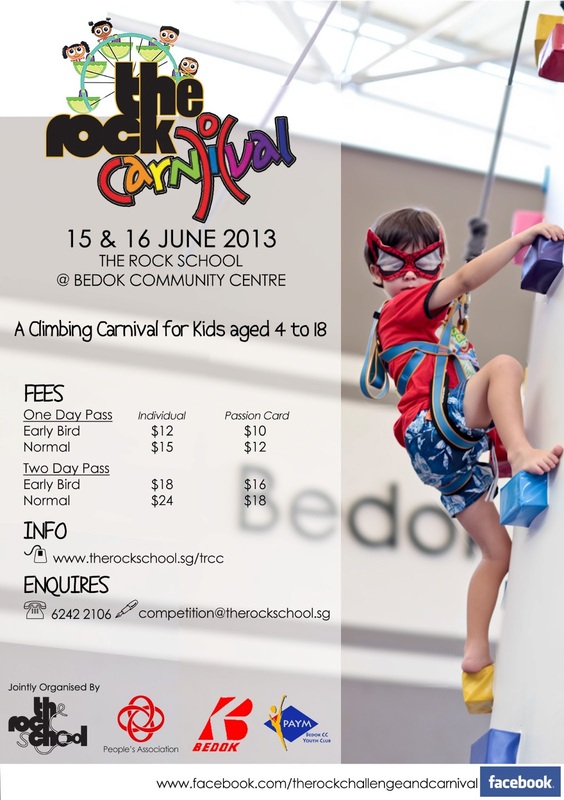 For those who wants to get a flavour before the start of a class, why not hop down to the rock carnival on 15 & 16 June. We were told that there will be a specially constructed bolder wall on site to allow kids and parents for a tryout. Bring your spidey gear along! i like the climing sport and i will join the climbing courses. thank for sharing the more information of climbing sports and technique.